When you’re spending time in nature, these genius uses for everyday items will lighten your load and increase your comfort. Weather has been fantastic for camping, and the season is ramping up. As families pack up their gear and hit the road, these genius uses of everyday items for camping might be a list to keep in mind! Over the years, our campers have come up with some creative solutions while camping! Space is always a premium, but more and more thought has gone into some really inventive ways to enjoy your time in nature. We’re finding the trends towards minimalism – away from the burden of too many material possessions and towards a simple, authentic, enjoyable family experience in all the fun that nature has to offer – is growing in the hearts and minds of folks around us like wild fire. 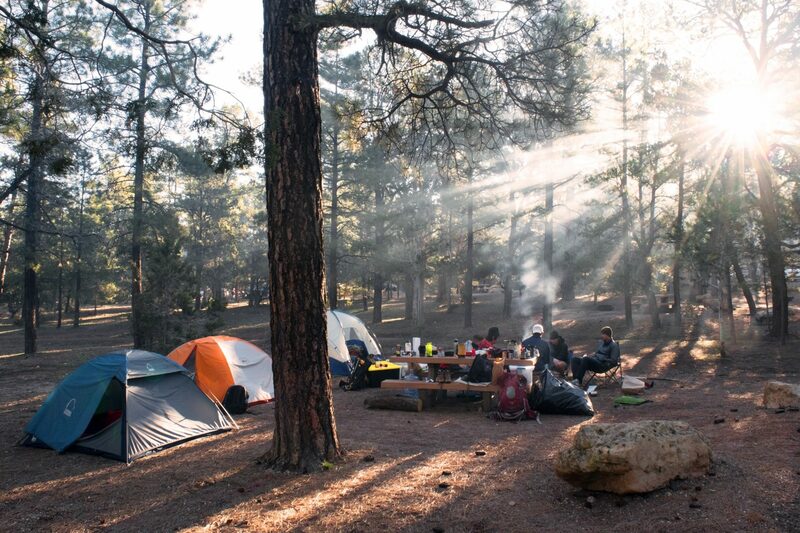 Along those lines, we thought we might share a few of our family favorites – genius camping uses for everyday items. Keep items tightly packed so they use less space. Use to attach a snare just about anywhere, giving you more flexibility with this trapping method.Make handcuffs, in a pinch. Repair backpacks, straps, tents, clothing. Close pant legs around the ankles to protect against ticks, snakebites, and mosquitoes. Attach items to packs, bags, or shelters. Storing and organizing other things as well? Screws, nails, sand, herbs, matches, utensils. To keep supplies dry, put your clothes, food, water-sensitive gear, etc. in a trash bag in order to keep them protected from the rain. Use it as an apron to stay clean during messy jobs, use to stay warm or even build a shelter! You probably know that you should keep your dryer’s lint trap clean, as lint buildup can pose a fire risk. However, what’s bad for the dryer is good for the campfire: Dryer lint works as excellent tinder if you’re trying to get a fire started. Crumple it up, and you’ve got an effective tool for scrubbing your camp grill’s grates, scour pots and pans. Wash it and wrap it around your water bottles and canteens for added temperature protection. Used sheets of aluminum foil can line your tackle box to keep moisture out and the rust off your hooks and other gear. The cornstarch you bring along to thicken your campfire gravies and soups can also be used for personal care. Soothe sunburns or bug bites by creating a paste from water and cornstarch, applying it to the affected area and then rinsing clean. Additionally, cornstarch can absorb oil from hair between showers; simply sprinkle a bit of cornstarch at roots, let it set for a few minutes to absorb the oil and then comb it out. Use these as tarps or drop cloths at your campsite. If you need tarp for covering luggage stowed on the roof of your RV or spreading on the ground on picnics, old shower curtains save you buying a tarp. Liquid detergent we throw out are often not as empty as we think. They still have a lot of soap sticking to their sides, so why waste? Use them to set up a washing station when camping - fill with water and you'll have diluted liquid detergent. Place them at one spot with a roll of tissue, a garbage bag, and a basin for collecting water. You can then use the water for washing hands or cleaning dishes. Have your newspaper delivered - wrapped in a plastic sleeve to protect it? Instead of throwing away these newspaper sleeves, you can collect them and use them as disposable work gloves or handy travel bags for wrapping items such as kitchen utensils, toothbrushes, and lotion bottles. After eating your oranges, don't throw your orange peels - the natural oil on orange peels is an excellent bug repellant. Rub the inside of the peel against your exposed skin and place the orange peels you have collected near your sleeping spot before retiring for the night. You're sure to have a good night's sleep free from mosquito and other bug bites. Stick them in your bag to prevent weird smells and stick them underneath the tablecloth to keep bees away! Instead of throwing out those cardboard tubes, put them to work as hair tie organizers, extension cord and Christmas light detanglers, and biodegradable starter pots for seedlings. They even work as napkin rings for outdoor parties. Fill clean, empty milk jugs with water and freeze it before leaving on your camp trip. Add the jugs to your cooler to save money on ice and keep your food cold for longer. When it melts you can use that water as drinking water for your family. Wrap duct tape around your water bottle or a flashlight to save space and also have quick and easy access to it. Duct tape is great for blisters and also can be used to remove ticks. Wrap a headlamp around an opaque plastic bottle to make an instant lantern. It can light up your tent by hanging it in the middle of the tent or you can leave it outside to use it at night.